Whether you call it a Groundhog, Woodchuck, Grease Pig, Whistle Pig, Whistler, Marmot, Chuck, or Monax, most people have heard about Marmota monax, the only rodent with its own holiday. Here are a few things you may not know about it though. Groundhogs are actually also our largest local ground squirrels. A large one can weigh over 12 lbs after fattening itself up by the end of Fall. The bone projection above its eye socket ( called a postorbital process) is a feature that helps place it in the squirrel family, Sciuridae. They are also the only rodents (note that all squirrels are rodents due to their ever growing incisor teeth) found locally that I am aware of that have white incisors. All other rodents that I know of around here have hardened enamel that is often yellow, orange, or otherwise discolored. Finding any rodent skull with white incisors is usually a good clue that you found a Woodchuck. The dip in the skull between the eyes is another good clue as it is unique to Marmots. Groundhog skull showing the postorbital process above the eye that helps determine it is in the squirrel family. Note the dip between the eyes as well that helps tell you, along with the white incisors, that this is a Groundhog. Whistlers (so-called due to their whistle-like calls, something I've imitated to locate them in meadows by sounding off myself) are one of the few local mammals that are true hibernators. Most other so-called hibernators wake up periodically and do not undergo the metabolic processes of real hibernation. Whistle Pigs drop their body temperature from 97 to 37 degrees Fahrenheit, breathe only once every 4-6 minutes or so, and their hearts beat only about once every 15 seconds. This clearly then is more than just a deep sleep that they enter. Most lose up to half their weight by the time they awaken in early spring. Those who do not build enough body fat do not survive. Regardless, the record age for a Woodchuck is 9 years and 8 months, set in the National Zoo in DC. Groundhogs are of course famous for being weather prognosticators, a legend transferred to North America and applied to groundhogs from European creatures who served the same roles such as badgers, hedgehogs, and bears in their mother countries but which were mostly lacking in Eastern North America. Originally based on Candlemas beliefs having to do with darkness and light, it now has morphed into much more lighthearted folklore. A Groundhog seeing its shadow is supposed to mean six more weeks of winter. While Pennsylvania's Punxsutawney Phil, the "Seer of Seers" is the best known and oldest (since 1886 there's been a "Phil" making predictions) of the famous Groundhog Day prognosticators, there are many, many more: Wiarton Willie (Ontario's white groundhog), Buckeye Chuck (Ohio State), Birmingham Bill (Alabama), Sir Walter Wally (North Carolina), General Beauregard Lee (Georgia), Pierre C. Shadeaux (Louisiana), a bunch from New York such as Staten Island Chuck, Dunkirk Dave, Malverne Mel, Pothole Pete, Holtsville Hal, and Ridge Lea Larry (must be all the boroughs I guess...), Chesapeake Chuck (Newport News, VA), Balzac Billy (Alberta), Chattanooga Chuck (Tennessee), Shubenacadie Sam (Nova Scotia), Woodstock Willie (Illinois), and so many more. Although they all claim the crown of the best at their job, few have a better than 50-50% record. Woodchucks (an Ojibwa term) are champion diggers (a common name Monax comes from Carolina Algonquian Indian for "digger" and is also part of the scientific name). Their burrows can go down 5' and be 45' long with multiple entrances and tunnels. They can move 700 lbs of soil a season. Many other creatures also make use of their tunnels, usually once they are empty or while the Groundhog is hibernating: foxes, turtles, toads, raccoons, snakes. weasels, mice, voles, shrews, possums, salamanders, and skunks (as I found out in a close call in my youth...). Rabbits don't live in them, but will dive into the nearest hole to escape predators, and their population often drops when there are no 'chucks around. All Marmots are not just great diggers, but can be good climbers just like other squirrels, despite their large size and fat. They may not do it often, but they will climb, especially in search of fruit or to escape a predator. I've twice surprised them (and myself) when I came upon them up in trees. They certainly awkward up in a tree, but are remarkably agile. Woodchucks have had a fairly prominent place in some Native American Indian cultures. Not only were they a good food item, but their tough hides made for good material. Some tribes saw woodchucks as an intermediary between the earth and sky, given the time spent either under ground or above. Some others, like the Cherokee, saw chucks as an important medicine animals due to their presumed herb knowledge of plants from the roots up. The Chippewa-Cree had what some might consider an unusual idea of groundhogs. To them, a marmot was a warrior image, someone who avoids trouble when possible, but fights hard if he needs to (sound advice for any warrior). So this Groundhog's Day, all self respecting woodchucks should be in deep "slumber." So have a Happy Groundhog Day, but don't expect to see any real wild woodchucks for some 6 more weeks or so. Since there are so many tongue twisters associated with woodchucks, how about this statement that is a bit more accurate: "If the ground is white, I'm out of sight." You'll have better luck spotting them standing up on their haunches by the side of the road during summer. It may not look like it, but both insects pictured above are the same species. 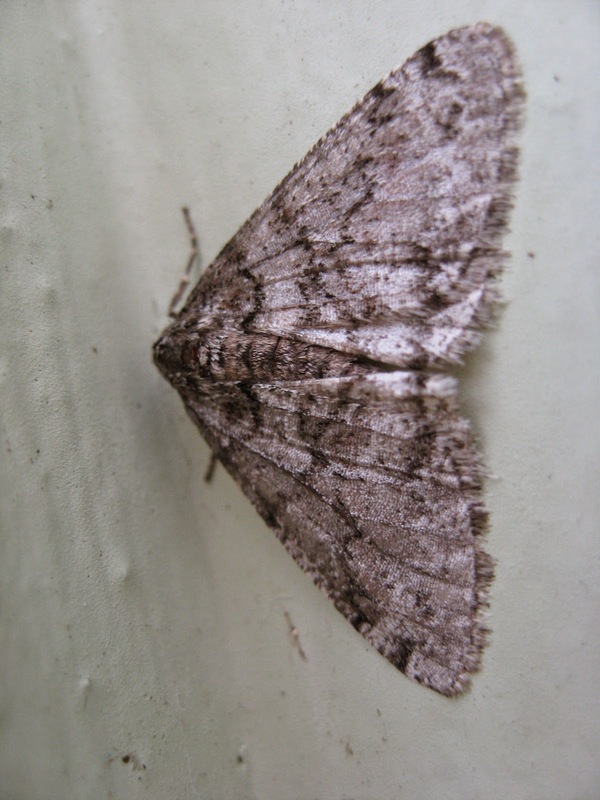 They are Fall Cankerworm Moths, Alsophila pometaria, and in this species, the adult females are wingless. This is one of the very few moths who remain active through the winter, at least during warmer days. These Geometrid (inchworm) moths mature late in the year and thus avoid many potential predators, since many birds have migrated and most bats are either dormant or have also left. ﻿These are the most likely moths you will find this time of year. Male Fall Cankerworms can be very variable in color and can hold their wings from either tightly wrapped to spread wide over their backs. They fly from Fall through the Winter. The females of course cannot fly, sacrificing wings in order to be able to commit more resources to egg production. They send out pheromones to attract the winged males and then lay their eggs in rows encircling small tree twigs. It is believed that in some populations and under certain circumstances, females can even reproduce without mating. The emerging caterpillars "balloon" in the spring by sending silk out to be carried and spread by the wind to the various trees and shrubs they feed on. They are unique among "inchworm" or "looper" caterpillars in that they have a reduced third pair of prolegs on their fifth abdominal segment. Other inchowrms have only two pairs of prolegs near the rear of their bodies. Otherwise, cankerworms can be somewhat variable in color, from light green to dark brown. They feed on a wide variety of deciduous trees and shrubs, with oaks, elms, and maples being their favorite caterpillar host plants. Fall Cankerworm caterpillars can be variable in color, but always are unique in having a 3rd pair of reduced prolegs as noted here by the arrow. Other Inchworms only have two sets of prolegs. The dark color forms are much more common during over populated conditions when outbreaks of this native caterpillar occur. That is another unusual trait of this species, they periodically have population explosions where they can severely defoliate the forest. These outbreaks can have some serious effects, even killing trees. This seems to be especially true to stressed trees, with red and black oaks being the most likely to suffer. Fall Cankerworm caterpillar in dark color form, typical of over crowded and population outbreak conditions. Healthy trees can recover, leafing out after the caterpillars have gone through their fifth molt and pupated under the leaves and loose soil. But those trees that are stressed by lack of water, along ridge lines, or repeated defoliations, can succumb and perish. Common Grackle and a beak full of multiple Fall Cankerworms to feed its young. Normally, natural predators such as birds, ground beetles, and certain parasitic wasps (Telenomus alsophilae being the most important) keep the populations in check or quickly control population outbreaks. Caterpillars of course make up the vast majority of the food items that almost all terrestrial birds feed their nestlings. But these natural controls can be interrupted and are not always able to keep a check on caterpillar numbers. That is when the debates about whether or not to try and control or manage those numbers (and how to do so) come in to play. In places with the resources to do so, sticky bands around tree trunks and other methods are used to survey (and control) female cankerworm population densities. The females are caught as they try to climb the trees. Some jurisdictions that find high numbers of caterpillars (over 91 or so per sticky band) use that as the level to start artificial control of their numbers. A cankerworm monitoring trap, here luckily filled mostly with other insects and spiders rather than cankwerworms. As some of you may be aware, this is something that has caused consternation and public debate for many years now, and is again happening. Those of us who try to manage our natural resources are often in difficult situations and often have to make tough decisions about what to do to try to achieve a balance of wildlife and what the environment can support. When we make recommendations for population controls of any creature or plant, we do not do so lightly. We, hopefully, use whatever knowledge or data we can to make those decisions and depend on our own expertise and/or that of others. We should not make these decisions without a lot of thought as to the consequences they entail or base them on emotion. It also can sometimes be difficult for us to then be questioned as to our motives or to have the public voice their own opinions opposing our decisions based on emotion or incomplete knowledge of the facts. At the same time, I do encourage folks to be informed, ask intelligent, non-emotional questions, and provide input, but to also understand that we sometimes end up having to pick the lesser of two evils or give in to ill-informed public pressure. It is for that reason that I am not questioning or second guessing the decisions of my likely better-informed colleagues. Having said all of that, and though this makes this a very long Blog post, I'd like to share some information on what I know about the decisions to spray for control of what is after all a native insect that can be a valuable food source, and at times can also pose disastrous damage to our remaining stressed forests. First of all, these are insects that have evolved with our native trees and so they do not under normal conditions cause the death of their food source. But we do not have normal, balanced ecological systems and conditions in most situations. Predator such as birds, beetles, and wasps are often in low numbers and in fragmented habitat islands. Our forests are already stressed and altered by invasive plants, changes in water tables, over browsing by overpopulated herbivores, lack of pollinators, low diversity and missing native plants, and so many other factors. This probably allows for some outbreaks in Fall Cankerworms that otherwise might not have taken place, and if let unchecked by natural controls, can be extremely damaging to the small amounts of fragmented forests we have left. Though the darker morph is often a sign of overpopulation, you can have both light and dark caterpillars out at the same time and even on the same leaf. Even if the outbreak is allowed to run its course, we have a lot fewer trees left to recover or to begin anew. If the leaves are consumed by cankerworms, then they do not provide food for insects such as other caterpillars or cover/shelter for nesting birds and other creatures. The leaves that grow back also do not supply the same quality forage the original leaves would have had. That means that some wildlife or plants may not recover. Noted entomologist and author Doug Tallamy, of Bringing Nature Home fame, has even been quoted as saying that in our jurisdictions some spraying is better in the long term than no spraying at all. But he also adds that it needs to be a measured integrated pest management approach, carried out as conservatively as possible, since eruptive populations eventually crash on their own anyways. The pesticide sprayed is normally Btk, which is naturally occurring, breaks down over a month or so, and targets only caterpillars, but it kills any type of caterpillars that feed on it. That can mean not only that most of the food is killed off just when the birds and some other creatures really need it most while breeding, but that for some localized populations, they may be locally extirpated, completely wiped out. Some though would argue that when all the leaves have been consumed by cankerworms, you get the same results, as well as no nesting cover and perhaps the death of a centuries old tree that cannot be replaced. But with our fragmented forests, sometimes other caterpillars, invertebrates, and their predators cannot recolonize or do so at a much slower pace. This includes such important natural controls as the aforementioned wasp species, meaning that we may then have to be locked into cycles of having to spray all the time, never allowing natural predator numbers (and other species) to recover. Even many birds do not recover, despite being able to fly in. Perhaps this is due to not having the same numbers of various caterpillars and other prey items available, or perhaps this is due to "nest fidelity" (returning to the same sites as they have had success nesting; so if not nesting one year, they may not return again for quite a while until new birds try again). Regardless, there can be long term or permanent effects one way or another. So there's the problem as to what to do, if anything: gamble that natural predators and disease will control the numbers (and they will, eventually), or spray to prevent perhaps even longer term affects from taking place. So what is my personal position in this dilemma? I do not think we should take a potential weapon out of our arsenal to combat these creatures if we need to do so someday. We should not wholesale decide that we cannot use Btk or spray to control cankerworms. Having said that, we need to be very careful and measured when we do decide to use this option as it will have definite effects on the ecology of the forests. It should only be used if we are reasonably sure of the consequences if it is not used. We need to take into account the population numbers, the color form of the caterpillars, the species composition and location of the trees (we know that black/red oaks along ridge lines and experiencing water shortage or other stress are most susceptible for example), and how much of an area we target. This takes resources though that we often don't have to get accurate measures, or studies to either prove or disprove that our actions have the intended consequences and not others. We really don't have many of these resources in sufficient knowledgeable staff, surveyors, and long term studies. I think that it is very likely that we do spray too much, trying to play it safe so as to not lose whole forests. When my own neighborhood was scheduled to be sprayed last year, I opted out, knowing that in my small piece of land we did not have too many cankerworms and that spraying would cause more harm than good. But what about other locations? Luckily, Arlington did not seem to have over populations of this species, though we don't have a budget to do much if we were to find extremely high numbers anyways. So, there are no easy answers. I would not vote to no longer do any type of spraying, because some day we may really need to. But I also think that we need to do some studies and have better resources, perhaps including citizen scientists, to help collect population data, and trained staff to be able to make those tough calls better. Today I noticed the first flower of the year about to bloom. Skunk Cabbage (Symplocarpus foetidus) is already poking above the ground and is about to bloom in our wetlands and bogs. It is usually the first plant to flower every year. It's scientific name is very fitting, translating to "fetid or stinking compound fruit." They do indeed smell and the fruit that results if pollinated is a compound fruit. 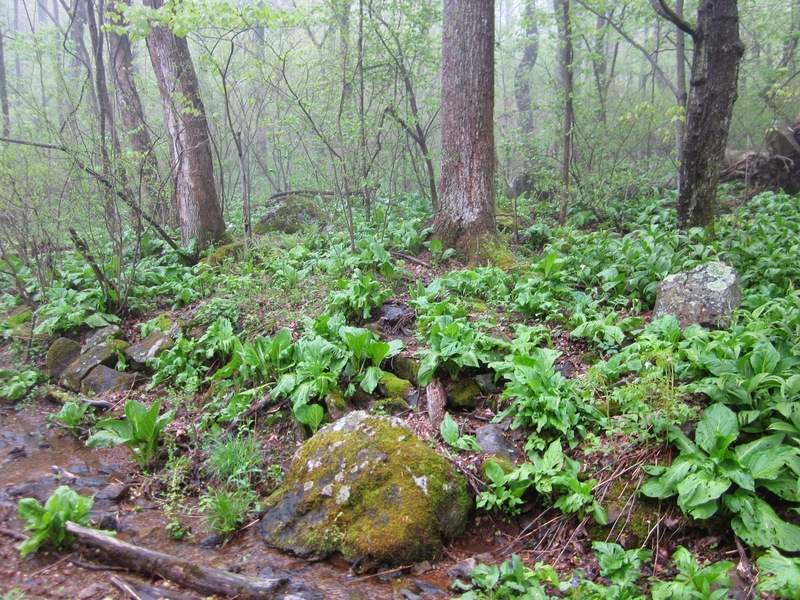 But this plant goes by a wide variety of common names however: Skunk Cabbage, Swamp Cabbage, Skunkweed, Meadow Cabbage, Fetid Hellebore, Parson-in-the-Pillory, Polecat Weed, Clumpfoot Cabbage, Midas Ears, and Polkweed for example. Skunk Cabbage has very large leaves. The odor (as well as dead-meat color) helps to attract its main pollinators of carrion beetles, carrion flies, and thrips. But probably just as important an attractant to ectothermic (cold-blooded) insects is the plant's ability to heat itself and the surrounding area through a process sometimes referred to as thermogenesis. This is very attractive and valuable to insects seeking warm refuge from the winter cold as well as food. The plant can actually generate a temperature 36+ degrees Fahrenheit above its surroundings. An emerging "spathe" housing the tiny flowers within can maintain a temperature in excess of 70 degrees Fahrenheit for up to 2 weeks. It can actually melt the snow and ice around it. It may take 5-7 years for an individual plant to bloom, but a plant can live in excess of 200 years, and some claim up to 1000 years. Slugs will also rob the flower of its yellow pollen and even eat its leaves. Few other things though are willing to eat the leaves which, as is typical with plants in the Arum family, are protected by calcium oxalate crystals which are capable of chemically burning most potential herbivores (though bears supposedly like them). Despite its odorous properties and chemical defenses, many Native American Indian tribes used this plant in a variety of ways. Since drying the plant renders the calcium oxalate harmless, it was used as food by some. But its real usefulness for them was as a medicine. The Iroquois used it as a de-wormer, to combat rheumatism and TB, to treat dog bites and other wounds, and even as underarm deodorant. The Menomini used it to treat cramps, convulsions, wounds, heart issues, hemorrhage, and in tattoos to ward of diseases. The Nanticoke, Chippewa, and Delaware used it for coughs. The Delaware also thought Skunk Cabbage could be made into a poultice against pain and as a tea for epilepsy. Many other tribes had similar uses. The leaves of this plant are quite large, up to several feet long and wide, in order to capture what little sunlight penetrates the tree cover. These provide shelter to many creatures. Some claim that Common Yellowthroats (a type of bird) for example will nest in it or under the leaves not just for cover, but because the smell of the plant helps mask the bird and its nest. This plant is very difficult to transplant once established, its roots evolving to growing after being buried in the muck, so it can have an extensive and very deep root system. Since it also does not reliably produce seed, you rarely see it in cultivated situations. So if you're tired of winter and seek the hope of spring flowers, check out your local wetlands and swamps for the first flower to bloom, now that you know a bit more about it. Skunk Cabbage tends to grow in swamps and other shaded wetland conditions. Someone asked me about shrubs to plant that could provide food for birds. Obviously native shrubs provide better food sources than exotics, but which to choose from so many different species? Not only that, but when I think of providing bird food, I also know that almost all our terrestrial birds feed their young insects, especially caterpillars (Lepidoptera), so those that are caterpillar host plants would be the best to choose. Luckily I had already been collecting this type of info for my book and so I was able to throw this together. I plan to dedicate a whole section in my book to this topic, but here's a rough preview. These are some of my recommendations for native habitat shrubs with a little about each. There are so many more that I could have chosen, but these are the ones I think have the best overall wildlife value, are attractive, and not as difficult to find in the horticultural trade (though I would avoid any cultivars and stick the straight true native species). Sorry I didn't have the best photos for each (now I know I need them and will get them) and for the length of this post. 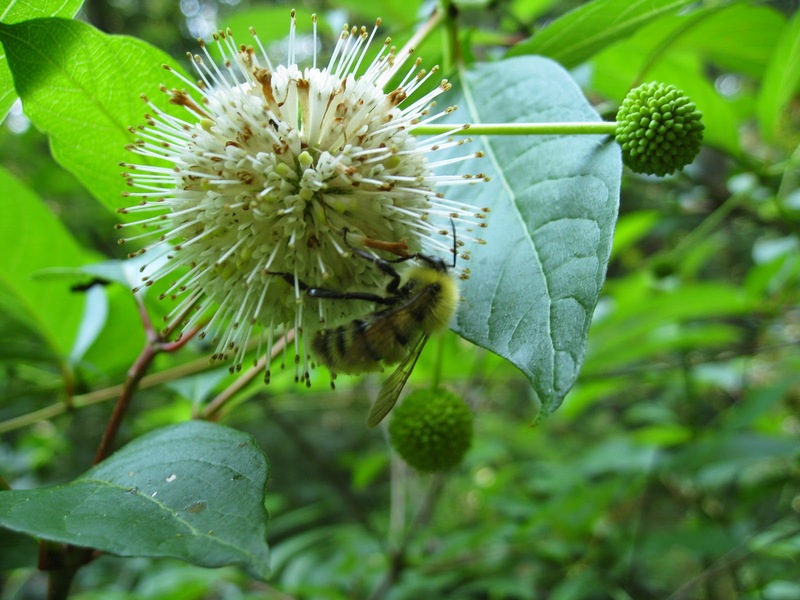 Buttonbush, sometimes called Honeyballs, in bloom with a Perplexing Bumblebee nectaring on it. Buttonbush/Honeyballs – Cephalanthus occidentalis I’m aware of no better shrub for attracting various pollinators. It also hosts 19 species of Lepidoptera and various birds (24 species) will eat from the seed heads (and eat the caterpillars it hosts too). This shrub (5-12ft tall) has globular white flowers and blooms better in the sun. It is very tolerant of wet conditions, but can easily grow in regular garden soil and can take some pruning. Buttonbush also attracts numerous nighttime nectar-feeding insects, including moths, as well as occasional hummingbirds during the day. Silky (Swamp) Dogwood with a couple of pollinators. Alternate/Pagoda Dogwood (C. alternifolia) gets to 15 feet tall, tolerates some shade, and has blue-black fruit. The only native dogwood that does not have opposite branching. Silky/Swamp Dogwood (C amomum) gets 6-10 feet tall and tolerates wet conditions where it is thicket-forming and can take some shade. Gray Dogwood (C. racemosa) gets to 15 feet, adaptable as to sun-shade, tolerates poor, compacted soils, but is not very common. Stiff/Swamp Dogwood (C. foemina) gets to 12 feet, liking light shade, moist soils, and has black fruit, but is also fairly uncommon. Maple-leaf Viburnum (Viburnum acerifolium) The most shade tolerant member of the group and shortest in stature. It is normally 3-6 feet tall with batches of dark blue berries that may persist well into winter. Not very tolerant of salt or pollution. Arrowwood (V. dentatum) Does best in sunnier locations where it will produce abundant blooms (but is not very drought tolerant) and get to about 12 feet in height. Bluish/black fruit are better liked than other viburnums as forage. Black Haw (V. prunifolium) 8-15 feet tall normally and often noted for its red fall foliage. It produces good displays of white flowers (especially in the sun) which then yield edible berries. It is fairly drought and wet tolerant, but not of compact or salty soil conditions. Possum Haw/Witherod/Wild Raisin (V. nudum) 6-12 feet tall and preferring more sun than shade. Beware that many plants are also called "possum haws." Holds its leaves well into winter, particular in the South where it is semi-evergreen. The clusters of whitish blooms turn into berries that change multiple colors before ending up bluish black. It blooms best with more sun and likes moist situations. The acidic fruits are edible. Running/Dwarf/Thicket Serviceberry (A. spicata sometimes listed as stolonifera) The shortest and rarest member. It only grows to 6 feet tall but spreads slowly providing a nice hedge effect. It produces abundant and fairly large berries which are delectable! It can also tolerate drier conditions than any of the other Shadblows I’m aware of. Allegheny/Smooth Serviceberry (A. laevis) This “Sarvisberry” prefers moist but well-drained soil and is probably the most common found in the wild locally. The fruits are tasty and the shrub can get to 25 or so feet. Downy/Canada Serviceberry (A. arborea) This is our tallest Shadbush, sometimes getting to 40 feet, but is normally much shorter. Although all Amelanchiers can sucker, this one does so the most. Its fruits are the least tasty of the group. It is also the least tolerant of dry conditions. Hawthorns – Crataegus spp. A confusing group as far as sorting out species. Both Washington (Crataegus phaenopyrum) and Cockspur Hawthorn (Crataegus crus-galli) are some of the better known natives. More than 39 bird species have been seen eating the fruits (botanically pomes, but called "haws" colloquially), even more eat the more than 168 Lepidoptera species that feed on this genus as caterpillars. The thorny growth provides excellent nest sites and discourages deer browsing also. Can get to over 35 feet tall, but normally are much shorter, very slow growing, like full sun and are drought tolerant once established. Often planted for their spring flowers, long-lasting fruits, and as a living hedge/barrier. Spicebush – Lindera benzoin Not only a caterpillar host plant for the Spicebush Swallowtail and 10 other species of Lepidoptera, but its berries are also a favorite food source for migrating birds (17 species noted). It is shade tolerant and very deer resistant. You need both male and female plants to produce berries. 6-12 feet tall normally and has been used for making tea and flavoring other food/drink. Elderberry Sambucus canadensis This genus is known to host 42 species of Lepidoptera and several other insects. Some 120 bird species have been noted feeding on its fruits (and on the numerous insects feeding on the foliage or visiting the flowers). The broken stems provide homes for mason and Ceratina bees at times also. It can get to 8 feet tall and prefers moist conditions and some sun. It will form clumps. The fruit is edible after some preparation and it has been used to make wine. The easy-to-hollow stems have also been used to make musical instruments, pea-shooters, and even blowguns once completely dry (but are slightly toxic if not dried). Fragrant Sumac (Rhus aromatica) The shortest of the batch, 3-6 feet tall typically, it can handle very hot and poor soils. It is “fragrant” in that its crushed leaves do not have a good odor and is actually rather rare locally in the wild. Winged/Shining Sumac (R. copallinum) 5-8 feet tall typically and with distinctive “winged” foliage. Spreads slower than most sumacs (excepting perhaps Fragrant). Smooth Sumac (R. glabra) 8-16 feet tall and without the “hairy” look of Staghorn. It is the fastest spreading and may not be suitable for garden settings. Staghorn Sumac (R. typhina) The largest sumac, getting to 20 feet on occasion. The “hairy” or velvet appearance gives it its name and adds something to its fall look in addition to the scarlet foliage. Chokeberries (Red, Black) - Aronia arbutifolia and A. melanocarpa respectively (formerly in the genus Photinia). Beautiful white flowers and long-lasting fruit make these a favorite for landscapes, especially in the sun. The fruit are not preferred food sources but are a “starvation food” readily consumed in late February or March by desperate birds, but still have some 21 species eating them. Plants tolerate most soil conditions including compaction, some salt, some flooding, and even pruning. Black Chokeberry is shorter (to 6 feet or so). Red gets to 10 feet sometimes. Both have been used to make juice and host 6 species of Lepidoptera. One of our more interesting plants is often not noticed until the Christmas holiday season. Eastern Mistletoe (Phoradendron leucarpum, sometimes listed as Phoradendron serotinum or P. flavescens) has evergreen leaves that are visible in winter and has all sorts of traditional uses associated with its European cousin and other species that have since been transferred to our native species. This plant is actually a hemiparasite. Its Genus name Phoradendron actually translates from Greek to mean "thief tree." Although it is evergreen and can photosynthesize much of its own energy, it anchors itself and steals water and sometimes some other nutrients from its host tree. It is not usually as harmful to the trees as some of its relatives in the American West and in other countries. That is unless the tree is already stressed, has a lot of mistletoe plants, and/or there's a drought, then it might cause some harm. Mistletoe growing on a low burl of a honey locust tree trunk in Alexandria, VA. The seeds and the fruits (drupes) are very sticky due to a substance called viscin. As they stick to the tree bark, specialized roots called haustoria grow from the seed and penetrate the bark, embedding themselves into the cambium layer of the host tree, the layer that transports nutrients and water. In an interesting twist of fate, the fruits are so sticky that many mistletoe species had their sticky fruits collected to make "bird lime" that was painted onto branches as a glue to trap birds. Francis Porcher, in his Confederate ethnobotanical treatise, actually mentions this as one of its uses during the Civil War. He also mentions using Mistletoe to treat epilepsy, paralysis, and even prevent rotting sickness in sheep. Its alternative name of the "kissing plant" probably had its origins in a Norse legend. Balder, god of light, had a dream foretelling of his impending death. His mother Frigg, goddess of foreknowledge and wife to the king of the gods Odin, made it her mission to make every living creature and plant swear to cause no harm to her son. She overlooked Mistletoe however, and according to some versions of the tale, the mischievous god Loki tricked the blind god of darkness Hoder (Balder's brother) to make an arrow from the mistletoe which then killed Balder. In her grief, Frigg's tears brought him back to life. She then commenced to kissing anyone who wandered under the Mistletoe-covered tree in her joy. So was supposedly born the tradition of kissing people under Mistletoe, though originally you plucked a fruit every time you kissed someone and stopped kissing people when the last drupe was gone. In some places, the mistletoe that had been harvested was burned after the holidays so the people who kissed under it would not marry. It was the unusual trait of being evergreen and producing fruit while most other plants, including the tree it lived on, were dormant, that appeared magical to some cultures. Druids would try and tap into the magical nature by following careful traditions when harvesting it. It had to be collected ritually using a golden sickle during the winter (and sometimes summer) solstice and was not permitted to touch the ground. This is quite the departure from the practice of shooting a sprig off a tree with a .22 caliber rifle, which is what is done in some locales now a days. A sprig of evergreen Eastern (American) Mistletoe leaves. Mistletoe is said to have many magical and medicinal powers. Some traditions involved making warring factions disarm while under it, or feuding spouses kiss and make up. It was said to be an aphrodisiac and a fertility aid (easy to believe with all that kissing), though the fruits themselves are toxic to people. Paradoxically, it was said to protect against poison too. Hanging a sprig over a doorway would supposedly keep evil spirits and witches at bay. The leaves were said to be a good treatment for blood pressure issues when made into a tea as well. Some even believed that when fashioned into a divining rod, it could find buried treasure. Native American Indian tribes were also documented using Mistletoe. The Cherokee would use it to treat head aches and convulsions. They also traditionally used it to treat love sickness (by ingesting it for 4 days and purging yourself of the problem through vomiting). I guess it would be easier to forget someone if you were that sick, come to think of it. The Mendocino people used it for such variable applications as abortions and to treat tooth aches. Other tribes were said to use it to treat hypertension and even as an oral contraceptive. Mistletoe is a bit mysterious as to which tree host it grows on. In some parts of the country they favor oaks, while in others maples, and still others a variety of trees such as honey locust, hickory, pecan, and black gum. Over 100 species of tree have been shown to be able to host it, though to a much lesser degree and variable by region. While we normally do not think about Mistletoe outside the holiday season, it is quite valuable to wildlife. It is relished by birds, as has been mentioned, while others favor it to nest in it as well. It also is the sole caterpillar host plant for the Great Purple Hairstreak Butterfly (2 other butterfly caterpillars feed on the Dwarf Mistletoe species in Western North America). A moth called the Mistletoe Marblelet also has its caterpillars utilize it for food. So while we may consider it a "kissing plant," "dung branch," or simply a parasitic evergreen plant, to many others it has meant many other things. To wildlife it is simply food and shelter.